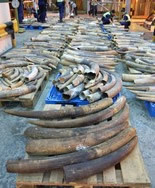 Members of the public are encouraged to provide information on illegal import, export and possession of endangered species to this department. Information Envelope, which is available at our headquarters, District Offices and public libraries. You can also click here to download (PDF format) the envelope. All the information reported will be kept in strict confidence.